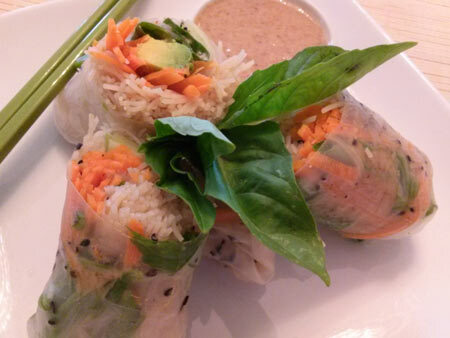 These Thai Spring Rolls are perfect as a light lunch or appetizer before an Asian themed meal. Almond butter replaces peanut butter in the traditional Thai dipping sauce. Look for gluten-free spring rolls and rice noodles for this recipe in your local health food store. Coconut Aminos is a coconut based, low sodium ‘soy sauce’ made by Coconut Secret. 1. Whisk together the dipping sauce ingredients. Add warm water in small increments to get a thick but pourable sauce. Taste and adjust seasoning. 2. Arrange all the filling ingredients in neat bundles on a large plate. 3. In a large bowl, add warm water and submerge a wrapper completely for a few seconds until lightly softened (about 15 seconds). Don’t let it soak too long or it will break apart. 4. Remove wrapper from bath and let excess water drip off. Place on a cutting board and gently blot excess moisture. 5. Working quickly, place a small handful of cooked rice noodles evenly over the middle portion of the wrapper. 6. Arrange remaining vegetables neatly in rows along the first third of the wrapper closest to you. Sprinkle with sesame seeds. Arrange 2 basil leaves over vegetables. 7. Drizzle 1 Tbs. of dipping sauce evenly over vegetables. 8. Tuck the outer vertical edges of the wrapper in toward the center. 9. Slowly begin rolling 1/3 of wrapper over vegetables closest to you. Continue rolling making sure to roll and tuck to get a tight clean roll. 10. Gently cut the roll in half slicing on the diagonal and place spring roll on a serving platter and cover with a lightly moistened cloth. Proceed with remaining rolls. 11. Serve immediately with individual servings of with dipping sauce on the side and a garnish of fresh basil. 1. Place almonds and salt in food processor and process with the ‘S blade’ until powder. 2. Slowly drizzle walnut oil in until it begins to hold together. Don’t add too much oil at a time. 3. Once it forms a ball, drizzle more oil until the almond butter becomes smoother and flowing freely in the food processor. 4. Store and refrigerate almond butter in a glass jar for up to 2 months. Have you made this recipe and would like to share your experience? Or comment? Please post below.